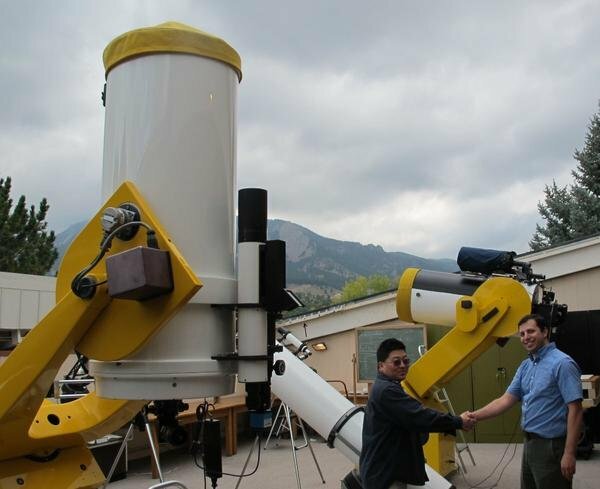 November 3, 2014 – Next summer, thirty-six of the world’s most promising high school students will gather at Sommers-Bausch Observatory on the CU-Boulder campus for the 57th annual Summer Science Program (SSP). During the six-week program, the students will study mathematics, physics, astronomy and computer programming. CU-Boulder Senior Instructor Douglas Duncan, director of Fiske Planetarium and a former SSP student and instructor, said the program was created in 1959, shortly after the Russians launched Sputnik, and was the only U.S. summer science program at the time targeting very successful high school students. “It’s like a Junior Olympic training camp, but in academics,” said Duncan, who is also on the SSP Board of Trustees. The program, which admits high-achieving students readying for their senior year in high school, provides in-depth, hands-on experience with advanced topics in physical sciences, mathematics and computer science through a combination of lectures, guest speakers, field trips and research work. The program curriculum is organized around a central research project: to determine the orbit of a near-earth asteroid (minor planet) from direct astronomical observations. Each team of three students will use the university telescopes to image a chosen asteroid, measure its size and position, and write software to predict its future orbit around the Sun, including the asteroid’s potential for collision with Earth. Students perform the entire research project from start to finish and gain valuable experience in collection, measurement, analysis, interpretation, and presentation of scientific data. Each team’s observations will be submitted to the Minor Planet Center at the Harvard-Smithsonian Center for Astrophysics. CU-Boulder’s extensive experience in space science research and education makes it a good fit for SSP. CU-Boulder has built and launched instruments to every planet in the solar system, designed a $70 million instrument now flying on the Hubble Space Telescope, is leading NASA’s $671 million MAVEN mission to Mars, and hosts the Colorado Space Grant Consortium, which has given hundreds of undergraduates experience in designing, building, and flying space instruments. SSP regularly features top scientists and engineers as lecturers and guest speakers, including Nobel Prize winners. It’s the only summer enrichment program managed and largely funded by its own alumni. More than 100 professional astronomers or physicists have been associated with SSP, either as faculty, students, or both. In addition to the 36 students at CU-Boulder, a second group of 36 students will attend the Summer Science Program at New Mexico Tech in Socorro, New Mexico. SSP is an independent non-profit managed by its own alumni in cooperation with Caltech, MIT, New Mexico Tech, and now the University of Colorado. About half of the SSP students currently go on to enroll at MIT, Caltech, Harvard University and other Ivy League schools. For more information on SSP, including fees and financial aid opportunities, visit www.summerscience.org. For more information on CU-Boulder’s Sommers-Bausch Observatory, visit sbo.colorado.edu.